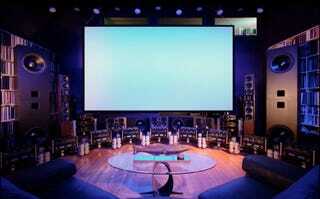 More than two years ago, Dolby trotted out Atmos, the most advanced surround sound system in history. It's been used to bring explosions and battles to deafening life in everything from Gravity to The Hobbit. It's available in hundreds of theaters and now Dolby plans to bring Atmos to your house. The system supports up to 128 speakers, and 64 discreet speaker feeds, including speakers above you. Consider that in the past most theaters have only been outfitted with 5.1 channel systems, which means left, right, center, left side surround, right side surround, and a subwoofer. So Atmos open a whole new world of sonic possibilities to sound designers, and they've taken advantage of it on loads of films. If you've heard the tech in action, you know it's powerful, adding to the illusory adventure of heading to the cinema. Bringing that tech into the living room is more complicated than the surround sound of yore. Simulating a 5.1 system is easy enough if you've got the space; you just need five speakers, a sub, and hardware capable of decoding the Dolby package. But for most people. putting speakers in the ceiling isn't a possibility. As with many audio technologies, bringing Dolby Atmos to the home will involve the science of tricking you brain. Though Dolby's blog post announcing the initiative doesn't provide a lot of details, it does mention a "Dolby Atmos module" to be placed on top of your current speakers at home. The first partner to announce they'll support Dolby Atmos is Pioneer. The company's excellent Elite series speakers and receivers will support Atmos through a firmware upgrade by the end of the year. Luckily, it appears your existing Blu-ray player will be able to read the Atmos audio feed, so you won't need to run out and get a new one. This post has been updated to reflect Pioneer's announcement that its Elite series receivers and speakers will be firmware upgradeable for Atmos compatibility by the end of the year. Originally, we didn't have confirmation.